I’ve been thinking about our Thanksgiving menu a lot and not doing much about it, until today. So after watching weather reports and reading up on some climate modeler’s predictions, I made the decision to have an early Thanksgiving dinner à la turkey. I’m still playing around with various components, but one thing is for sure – we are having potatoes. But we aren’t having mashies. 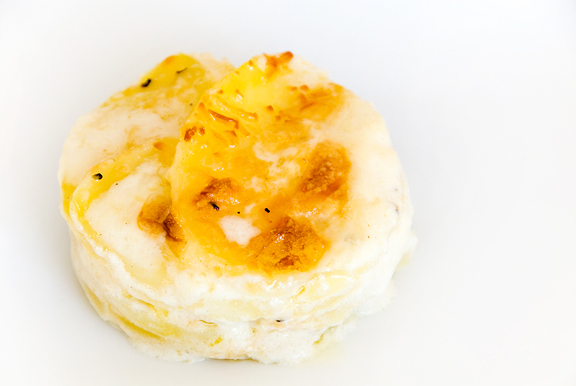 While we both like mashed potatoes, we both love potatoes au gratin. It happens to be one of those dishes that benefits from an extra day of sitting around. The flavors mature with time. So I started on the potatoes today as we will nominally have the bird and the works tomorrow. Honestly, when I think of the number of sides that are served at a “traditional” Thanksgiving dinner, it makes me feel a wee bit sick in the tum. Is it me or is that an obscene amount of food? The recipe comes from Fine Cooking, but I’m not sure which issue as it has appeared a number of times over the past several years. In the November 2008 issue of Fine Cooking, you can find a nice variety of gratins, but this one is fairly straightforward and delicious… and decadent. 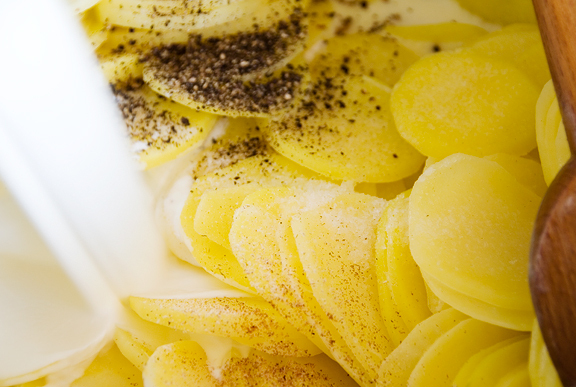 The potato slices are parcooked in milk (I like them a little more than parcooked) and then hot cream is added along with some pepper, salt, and nutmeg. I personally love the combination of yukon golds with nutmeg and Gruyère cheese. I typically bake the potatoes until most of the cream becomes gooey and thick, the potatoes are soft, and the top is golden brown. The cream will continue to thicken as it cools. A nice way to serve it up is to take a biscuit cutter and slice out columns of potatoes au gratin (it should be cooled to warm so that it doesn’t fall apart). This is a definite crowd pleaser when entertaining. Preheat oven to 325°F. Add the potatoes and milk to a pot and bring to a boil. Simmer the potatoes until they are parcooked. Add hot cream and season the potatoes to taste with salt, pepper, and nutmeg. 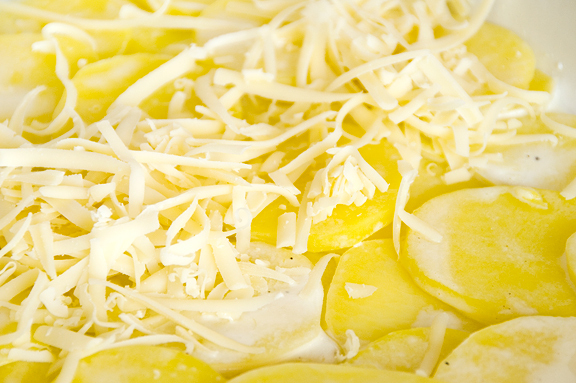 Layer a fifth of the potatoes in a buttered baking dish. Layer a fifth of the Gruyère over the potatoes. Layer a fifth of the Parmesan. Repeat the process and finish with cheese on top. Sprinkle the top with bread crumbs and dot with butter. 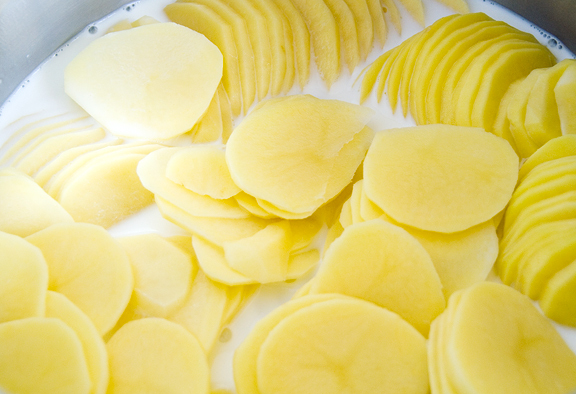 Bake the gratin for 45 minutes or until cream thickens, potatoes are soft, and the top is golden. Let cool to warm before serving. (Jen’s Note: Flavor improves if left to sit for a day). 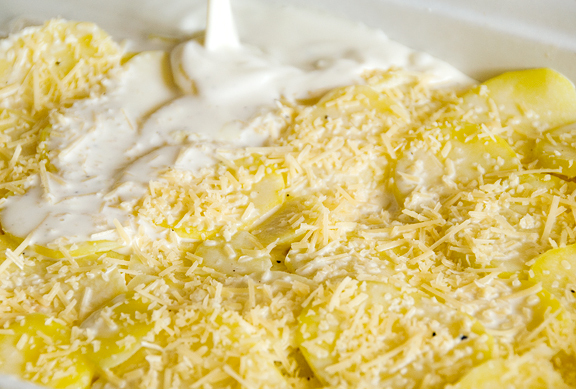 A great ideaü That Potato Gratin looks delicious and really pleasing! This is bound to be a crowd pleaser! Using a biscuit cutter is a fantastic idea! So cute. I like the cookie cutter presentation! Leeks and/or ham would be tasty in it, too. MMM, one of the best ways to eat potatoes. All that cream and cheese. Looks absolutely delicious…Great recipe! Thanks! That looks great, I think I’ll add it to my Christmas day menu! I wish we were hosting Thanksgiving dinner this year – I would make this in a heartbeat! Maybe for our Christmas dinner in December. I really need to pick up Fine Cooking; I’m just loving all the recipes you’ve posted about from it! Comfort food, for sure. Thanks for the idea on presenting. I would never have thought of it and I’m sure it does pretty up the dish. These sound so yummy; I’ll be making them soon. That’s perfect. And Charles hates mashed potatoes, so maybe I’ll make these instead and save the day. That sends me right back to my mom’s kitchen!! Love potatoes in all forms but I especially love them layered with cream and cheese!! Hope you get to sky on Thanksgiving, now that would just be the icing on the cake! This is one of my favorite dishes – comfort food which can be elegant when it needs to! I would love to make this instead of mashed potatoes, but my family would balk if I ever suggested that. Definitely it’ll be something I make after Thanksgiving. I think this is a perfect substitution for mashed potatoes at Thanksgiving! my potatoes au gratin never turn out this lovely. great job and happy thanksgiving! I love the idea of cutting out little rounds. This would be great for my buffet Easter brunch (you know, where we celebrate baby chicks and bunnies and spring skiing). I am forced into making mashed potatoes for Thanksgiving–Sophie would cry if I did not. And she’s got a point that the gravy does need somewhere to go. Sharon – yeah, it finally dawned on me that there is a way to serve this dish without having it appear like vomit. Peabody – yup, and then a death mark to work it all off – ha ha ha! Joanne – yummm! I’m sure it will be a hit! Amy – it works great any time of year (but especially when it’s cold out!) I guarantee that you’ll love FC. Fiona – ?? I can’t see hating mashed potatoes, but I do hope he goes for this dish. Tartelette – mmm mmmm mmm! Yes, I don’t know if we’ll have enough decent snow to ski, but I am starting to get a little desperate. Kathy – Happy t-giving right back to ya! Christina – that’s one of the reasons I like not having a traditional meal… because I get to experiment :) Hope you do make it eventually, I think you’ll like it! Mark – yar, I have had so many disappointing potato dishes (like a potato galette) because they are undercooked. Parcooking helps so much (but it took a recipe to get it through my head). Baked cheese and potatoes; what a great combo! Kevin – it certainly is! I made these over the holidays and they were a disaster (albeit a tasty one). Hopefully you can help me figure out where I went wrong. First, I had a hell of a time parcooking the potatoes. I kept the milk on a low simmer, but a layer of potato slices fused themselves evenly over the bottom of the pan and started to burn. 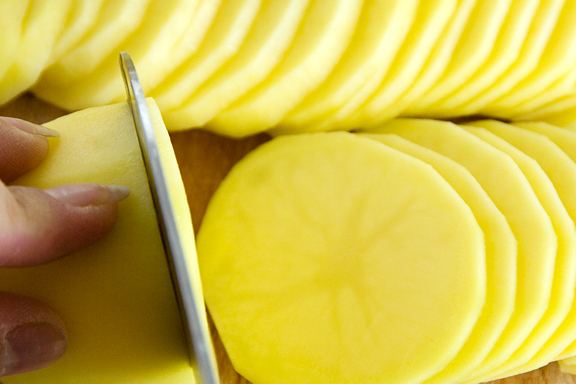 I stirred them occasionally to try to prevent this, but I didn’t want to break up my pretty potato slices too much. Did this happen to you? Should I use the double boiler? Stir like mad? Turn down the heat? The next problem was that I baked the dish until it had a beautiful golden bubbly top to it and let it sit for a while, but when we cut into it at dinner it was very, very liquidy. And I hadn’t even added all the liquid because it didn’t fit in the baking dish. Was I really supposed to add 2 cups of milk + 2 cups of cream to the potatoes? Thanks for your help! I really enjoy reading and cooking from your blog (and don’t usually have trouble with the recipes). 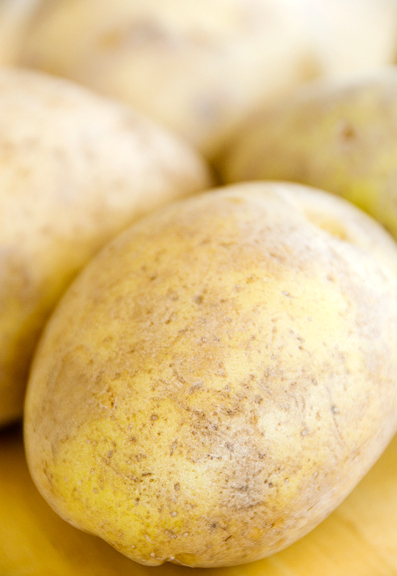 Mary – my potatoes tend to stick a little at the bottom, and yes, I do scrape them off and stir them around. I don’t worry too much about breaking up the slices since they all get layered and smothered in cheese and cream. I just use a regular pot to boil them. Perhaps turn down the heat and cover the pot (to help steam them). How long did you bake the potatoes for? I find I have to bake a minimum of 45 minutes to get the sauce down to a good creaminess – sometimes longer. Also, are you using full fat milk and heavy cream? How large was your baking dish? Just trying to trouble shoot if possible. I’m sorry you had such trouble with the recipe. How were the leftovers the following day? I find they thicken much better after a day (but are still good the day of – albeit a little runny). Okay, I’ll stir more next time and also like the covered pot idea. The leftovers were still runny, though closer to right. I used a heavy round baking dish that was about 12″ in diameter. What size do you use? I also used skim milk, which may have been part of the problem. I baked it for 45 mins and didn’t bother checking whether the liquid had thickened because it looked so perfect on top. Obviously I’ll be careful to check this next time. Thanks for your help in debugging. Mary – I use an 11×14 dish, but I also add more potatoes than called for (maybe an extra 1/2 pound). Yeah, try using whole milk and see how that works. Good luck. Can I prepare it the day before? If so, should I cook it the day before also & then re-heat it before serving? Liz – probably serves 8 easily as a side dish. You can prep the day before and cook it then reheat it the day you serve (the flavors are actually better the next day). would it be less runny that way? I need to make enough for 18 people so I thought I would do 2 large pans – double your recipe & add some “extra” potatoes (it seemed very runny when I followed the directions & made a single batch earlier this week. Liz – as I stated in the post, it becomes less runny as it cools. You say better cooked the day before. How to reheat? Thanks. Ann – you can reheat in the oven at 350°F until bubbly.